Back in 2011, the mobile email opens were accounted for only 11% of the total email opens. However, with passing years, mobile email opens have seen a drastic growth, making it to 45% of the total opens. 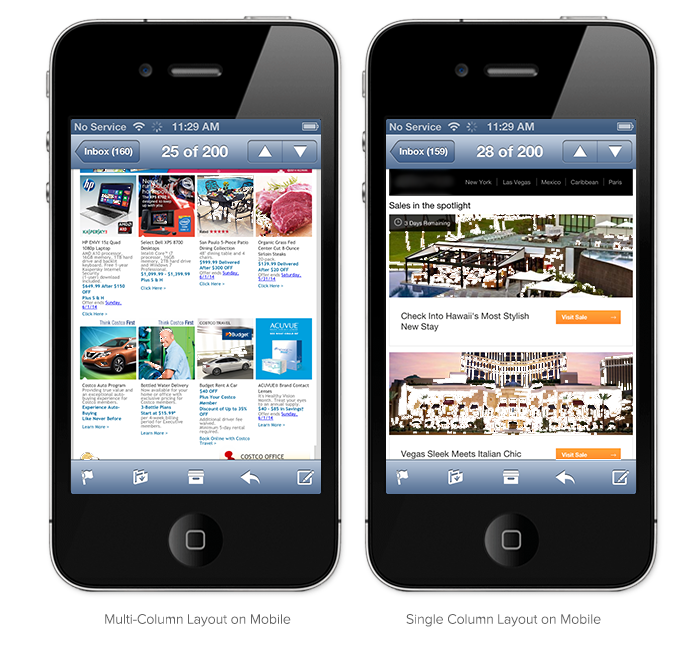 The mobile opens are not only growing but also managing to surpass the email open share for desktops. The sudden rise in mobile email opens has made a majority of brands improvise and optimize the email experiences for mobiles. Here are the top strategies that you need to follow when optimizing the email experience for mobile users. It is very difficult to concentrate upon the tiny text when viewing the content over mobile. To make sure the font remains easy to read, we recommend you to use 14 pixels as the minimum size for body text and 22 pixels for headings. For iOS devices, the text below 13 pixels is resized automatically to that they look larger. It is best when you evaluate the email content from time to time and remove all the unnecessary elements such as irrelevant links, images and text. Your task is to maintain the email content in a way that it is concise yet interactive. Keep in mind the fact people always like to settle for content that is less and quick enough to go through. Most of the newsletters are designed using multiple columns, but for mobile friendly emails, you should prefer a single-column layout. When you opt for this approach, you can make sure that the legibility of your content increases drastically. Other important aspect is to stay away from the detailed navigation bars as these bars will break when viewed over mobile. 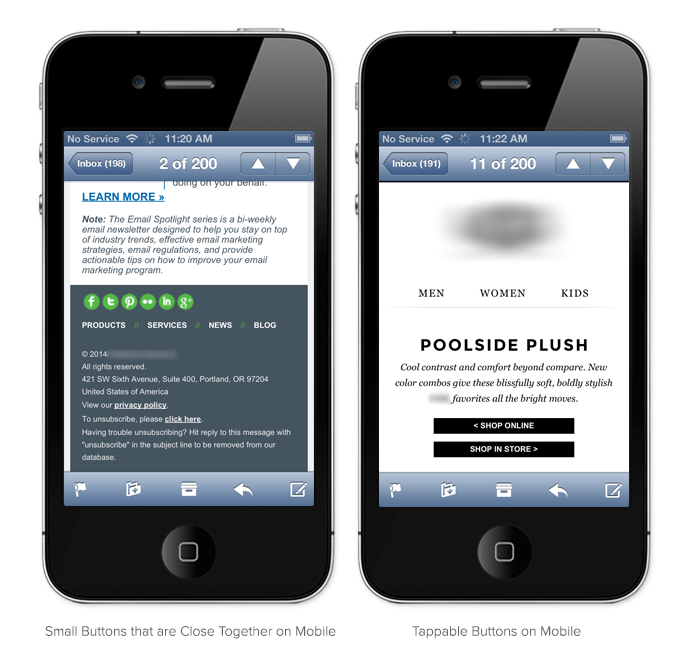 For emails on mobile, you need to ensure that you have call-to-action (CTA) buttons that are easy to tap for the users. Place the CTA at an easy to identify position, such as at the front and center of the content. The minimum size for the button has to be 44 px x 44 px. The reason why we are suggesting you to place the optimized content at the left side is because during auto-scaling, the right side of emails cuts off. If you notice, most of the email apps available over Android and Blackberry display only the upper left-hand corner of email. You can make use of mobile email apps for blocking the images by default. 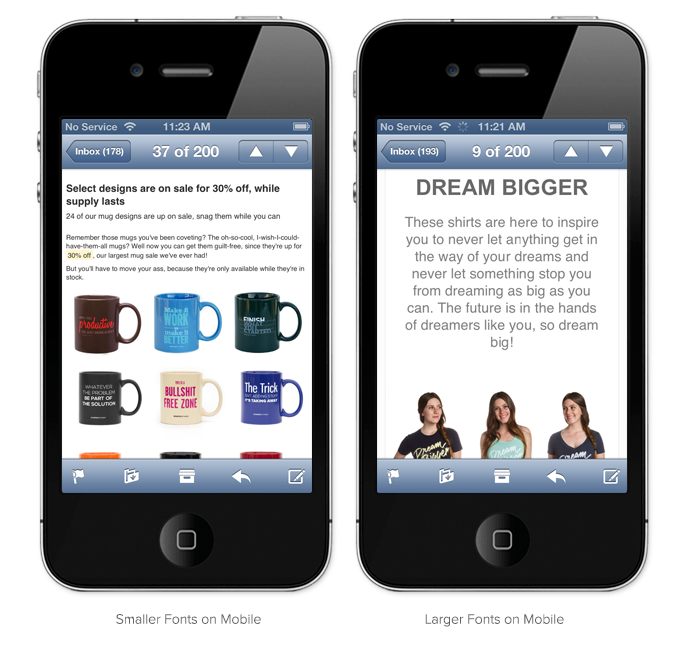 This is why, your email should be optimized to be viewed even without images. ALT text can be used to combat the effect of missing images. So, even when the images are missing, the subscribers can be offered some framework. Other benefit of ALT text is that it makes your emails will seem more accessible to all those visually challenged subscribers who are making use of screen readers.